Several of the Brethren Missionary Herald Company staff persons spent the day today at the regional meeting of the Evangelical Theological Society, being held at Warsaw Community Church in Warsaw, Indiana. The meeting was hosted by Grace Seminary. 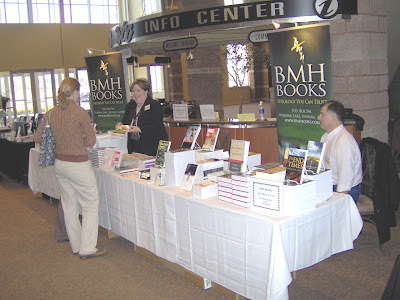 BMH books are widely used by professors in Bible colleges, Bible institutes, and seminaries for their courses, so the day included many fruitful conversations with prospective buyers as well as prospective authors. Ann Myers (left) and John Leonard (right) of the BMH staff were on hand, as well as editorial director Liz Cutler Gates and publisher Terry White. YIB (Your Intrepid Blogger) takes to the road/air this weekend (snowstorms permitting) to participate in worship services Sunday morning at the Penn Valley Grace Brethren Church in Telford, Pennsylvania (Tim Boal, pastor) and then to represent BMH Books at the Northern Atlantic Fellowship district conference, also to be held at Penn Valley. Dan Jackson of the Myerstown, PA, church is the conference moderator and host.